Just keep your pants on, and your weapons holstered. Hear me out. I favor gun ownership, I do. I grew up in a family of proud recreational and subsistence hunters, in a state where gun ownership was accepted and expected, and all kids took gun safety classes at public schools in the 4th grade. Somewhere I’ve got the iron-on patch to prove it. So I favor gun ownership. Personally, I do think wanting to own a semiautomatic or automatic weapon for fun is ridiculous, especially when factoring in the scary “what if’s” of it falling into the wrong hands, but that is my highly subjective opinion. I also think effective gun legislation is a good thing for all of us. But I would give up every possible gun law, every background check and every restriction on large capacity magazines if all related effort and resources on both sides could be dedicated to treatment and prevention of mental illness. Because the gun lobby is right (yep, I went there, probably the ONLY time in my life). There will always be criminals who kill each other and the occasional innocent bystander in the act of living their criminal lives. And those criminals will always find a way around a background check or reasonable waiting period. And if they can’t find a gun, they’ll find something else. The nature of the human condition pretty much guarantees that there will always be domestic violence, angry flares between spouses or friends, and coldly calculated murders of one person by another for money or power. If there are no guns handy, other weapons will be and have been found since the beginning of time. Club, blade, poison, shovel – if determined, people will kill people. But here is what we DON’T have to accept. We don’t have to accept young men with empty eyes and mental illness untreated and/or unrecognized by family and friends, allowed to ferment in an ugly, lonely brew of paranoia and anger. Far too many times in recent months and years, we have looked at the newspaper photos, and heard a disturbingly similar set of quotes from family and friends. There were warning signs, they were worried, they never thought he would go that far. Why aren’t we more heartbroken by these shattered souls? Why do we continue in blind partisan arguments about gun control while tacitly accepting that the shooters are beyond saving? Why is it still so ridiculously difficult for families to access prompt, effective and complete treatment for loved ones with serious mental illness? If we won’t help these boys, if we can’t commit to recognizing them and helping them, then I am coming for your guns. If we cannot change our societal approach to these lost young men, I am going to fight to take away their weapons of mass murder. If in the process I trample on your “right” to have your toys, or to buy more toys on a weekend trip to a gun show, so be it. Because if we don’t, these lost boys will kill as many people as they can. If we will not fight to make them better, I WILL fight to limit the damages. Because people may kill people, but really big guns let them kill more people, and that’s not ok.
Do you hear me? That. Is. Not. OK. If we cannot look the next victim’s mother or son or girlfriend or little brother in the eye and tell them we did everything in our power to treat the shooter, then we BETTER be able to say we made it as difficult as possible for them to wield high capacity weapons. If a person is determined to run you over with a car, you do not make it easy for him to get an SUV or a tank. If Adam Lanza had only had a handgun, he would have been able to kill far fewer six- and seven-year-olds at Sandy Hook. Don’t get me wrong, I know it isn’t just about the guns. If Jared Loughner’s parents had been more educated on mental illness, on its treatment and the fact that there was help and hope for their son, maybe he would have been diagnosed and treated BEFORE shooting Gabrielle Giffords and nearly 20 others. We must prioritize it as a public health issue, not a private shame. We must change the way we parent in our communities, so when families are struggling with kids with mental illness, we reach out to them in love, not judgment. We must be willing to see mental illness in our own children, and treat them. We must fund treatment for those who need it. We must fund supportive housing to make it possible for them to stay stable once they are treated. They are His children and they deserve our best, before they can do their worst. When we’ve done all that, then you can have your guns, as many and as big as you want. Note: I drafted this post six months ago, frustrated by reports that both Adam Lanza’s mother and Jared Loughner’s parents seemed aware of their son’s issues, but for whatever reasons were unable or unwilling to get them help. I was driven imagining the loss and heartbreak of both victims’ and shooters’ family, but I was never sure when to post these thoughts so as not to exploit any particular event or victims. In that six-month period, through last Monday’s shooting in the Washington DC Navy Yards, there have been 13 separate mass shootings, resulting in the senseless loss of 65 lives. While I don’t know how many of those shooters were mentally ill, I believe that all of them were to some degree. It seems that in America, there is no “good” time to post this. Posted in childhood mental illness, Rants, Uncategorized and tagged gun rights, mass shootings, mental-health, social justice. Bookmark the permalink. I don’t know if I’m actually supposed to HAVE a guardian angel, not sure where the Protestant theology is on that. * Theological questions aside, if I did have a guardian angel, it would have to be an octopus, no question. The poor thing would NEED eight arms just to keep up with me. In the last 15 months, I’ve given myself permanent nerve damage in my hand; blistered and scarred my leg with boiling water; and nearly blinded myself with yard implements. Honestly, I have no self-harm urges, I’m just equal parts clumsy and impatient – a dangerous combination. My parents always tried to get me to think before I act, but that didn’t take. I am usually too passionate, impulsive and overenthusiastic to do any such sensible thing. Anyhoo, it all started back in May of last year. I was preparing nachos, one of my family’s favorite meals. Well, one of my favorite meals, and thus one we enjoy regularly. No plate of nachos is complete without guacamole, which I was just beginning to make. I cut the avocado in half, and then went to remove the avocado pit the same way I always have, since my teen years in Alaska when an avocado was a truly foreign and glamorously ethnic vegetable. 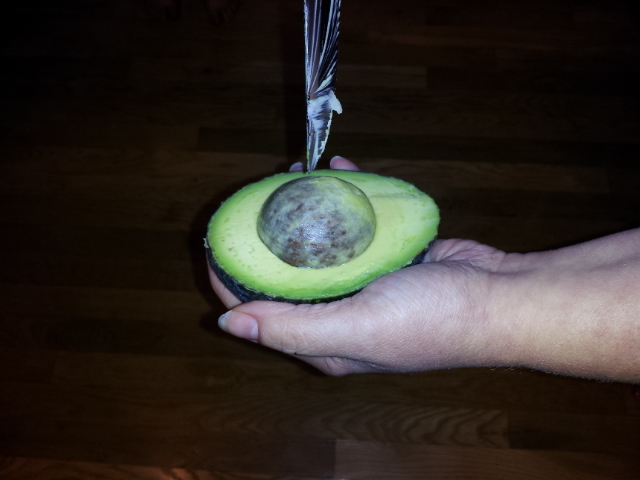 Raise the blade up and vigorously drive it down into the avocado pit, tip down. I was also left with what appears to be permanent numbness along the entire pinky side of my middle finger. I know, you wouldn’t think that the pinky side of your left middle finger would be important for a right-handed person. However, I’ve found that it makes flossing shockingly difficult, and I also use that finger to operate my car’s turn blinker. I’m just waiting for the day I have to explain my sub-par blinker-operating handicap to a police officer. The lesson: Apparently, THIS is how you are supposed to pit an avocado. You’re welcome. This is not a funny story, unfortunately, and I apologize for that. The least I could do while hurting myself is be funny, cause if we can’t laugh at it later what really is the point? But I was just carrying some potatoes over to drain in the sink a few months ago when I sloshed the boiling water on my leg. It WOULD have been funny if we’d had guests, as I easily set a world record for quickly stripping off a wet pair of jeans in the middle of the kitchen. As it is, I now have a 8-inch long area of permanently discolored skin on my thigh. The good news is I no longer feel guilty about not training for the Mrs. Middle Aged America Bikini Pageant. For when I’m actually middle-aged, you know, in the FUTURE. Cause that was TOTALLY gonna happen. Meh, that was probably the lifeline I cut anyways. The lesson: This is pretty clear, actually. NEVER let me carry boiling water anywhere around you or your loved ones. You should know right off that my ophthalmologist says my retina looks great. Firmly attached. I didn’t feel like I could write this post until I knew for sure whether I had ACTUALLY nearly blinded myself being stupid, or fallen blessedly short of that undesirable milestone. I mean, if I wrote a lighthearted post about my tendencies to hurt myself and then went blind shortly thereafter, that would have been poorly thought-out blog planning on my part for sure. Awkward….. Especially if the blindness made it difficult to update the post and ask for your prayers and explain that I would have to learn all new technologies for the blind before I could keep blogging. This time, I was just laying innocently on my hammock, enjoying the summer breeze, minding my own business. 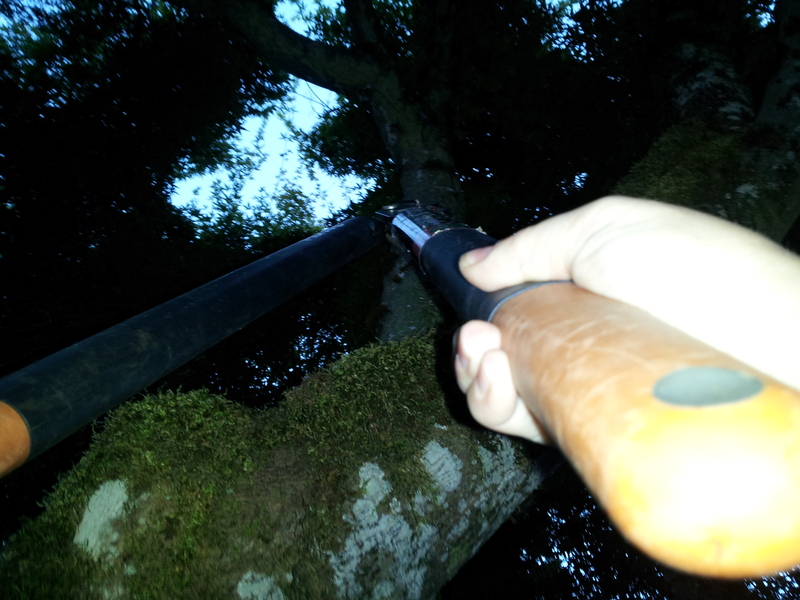 But there was a REALLY annoying branch in the maple above my head, and it was completely ruining my view. It was all twisted up against the trunk under another branch, very aesthetically displeasing, and it was just. Ugly. Clearly that could not go on. So I grab these AWESOME pruners I got from my dad and a stepladder. Cause, you know, I’m 4’11” and nearly all pruning requires a height assist of some nature. Heck, I practically need a stepladder to weed. Anyhow, to get close enough to deal with the offending branch I had to get directly under it, and stand on the top step with the pruners held directly over my head. I’m sorry if you can already see where this is going, but as I mentioned before, I’m kinda impatient. I didn’t think to ask my 6’1″ husband to come clip the offending branch until AFTER the pruners slipped off the branch and descended (HANDLE DOWN, THANK THE GOOD LORD WHO IS FAR MORE GRACIOUS THAN I DESERVE) into my right eye. Dramatic reenactment of my view right before the end of that handle landed on my eyeball. The lesson: Don’t do anything like that. Ever. At all. In addition, the blow to my eye caused some of the vitreous eye goo to detach from my retina. This vitreous goo detachment is apparently permanent, and was going to happen with age at some point, but it was definitely the last humbling straw in my run of hurting my own darned self. I really should be forced to spend my days lying quietly on a soft pile of mattresses in a padded room. The best I can do is recommend that if you see me near either blades of any kind or boiling water, RUN. Just run. And pray for me. *Of course, I couldn’t stand to leave it at that. If you are a smidgen of the truly nerdy that I am, you can go here, or here, or here, for further thought. Bonus science geekery: I am not great at including images in my blog yet, which explains all of the poorly lit photos, but while hopefully googling for an image of an octopus angel (Hey, it could happen!) I found this post about strange sea animals. FASCINATING. Posted in grace, humor, Uncategorized and tagged comedy, humor, Random. Bookmark the permalink.